Winter is on the way and perhaps you’re thinking about moving south. Whether you’re looking to Latin America for new markets, hoping for cheaper rent or running from shoveling, the southern half of the Americas have a few promising hubs full of new accelerators, incubators, and increasingly, success stories. Although it’s highly segmented on national and economic lines, the Latin market represents the second-most spoken language in the world (Spanish), and opportunities there are increasing as technology reaches the masses. Here’s a flyover of the most promising startup hubs south of the Rio Grande. These four urban hubs represent some of the most promising regions in Latin America — with growing talent pools, universities, government support and growing appreciation for innovative business models. Arguably the most cosmopolitan city in South America, Buenos Aires may also be the region’s largest startup hub. While the economic stories out of Argentina are all about the national credit default, some of South America’s largest successes — like MercadoLibre, one of the only Latin American startups now traded on NASDAQ — have come out of Argentina. Bitpagos just announced $600,000 in seed funding to make Bitcoin more usable in South America. On the other hand, Wisconsin entrepreneur-turned-investor Nathan Lustig warns that the investors in the “Paris of South America” also face red tape and economic instability. Drawbacks: Challenge of navigating a parallel economy; nearly impossible to exchange large dollar amounts. Comparable startup community size: Boulder, Colorado. Buenos Aires has fewer investors than Boulder, but a similar number (330) of startups, according to Angel.co. And both cities offer some nice scenery. Expect a more business-friendly business culture in the Rockies than east of the Andes, however. You can’t tour Latin America without giving credit to the biggest kid on the block. Brazil’s largest city, São Paulo, has a GDP larger than the GDPs of neighboring Argentina, Chile, Uruguay, Bolivia and Paraguay combined, according to fnbox. The 22 incubators in the city have already pumped out 182 companies. Successes include Boo Box for online advertising and Peixe Urbano for shopping. Lustig pointed out that Brazil’s language, culture and size call for recognition as its own market in Latin America. “It’s probably worth thinking about Brazil as almost a separate thing,” he said. Drawbacks: Programs like Start-Up Brasil offer more red tape than comparable initiatives in neighboring countries. Markets differ widely in the poorer north of Brazil compared to the more developed south. How’s your Portuguese? Comparable startup community size: Cambridge, MA. I’m not comparing cultures here, but São Paolo and Cambridge have matching average valuations and number of startups. Chile’s government brought new attention to the Andean nation when it started handing out $40,000 each to up to 300 startup teams in 2010 through an accelerator program dubbed Start-Up Chile. The program was among the first of its kind worldwide. In the midst of Latin America’s undeniable machismo, the capital of female entrepreneurs is here in Santiago, where 20 percent of startup employees are women. Chile has its share of successes like Cumplo, for peer-to-peer lending, or Compara Online, a unique site for comparing financial services, which has raised over $16 million to expand out of Chile. Drawbacks: Start-Up Chile isn’t for everyone, and the program is the main reason you should be thinking of working on a global startup in Santiago of all places. Comparable startup community size: Houston, Texas. 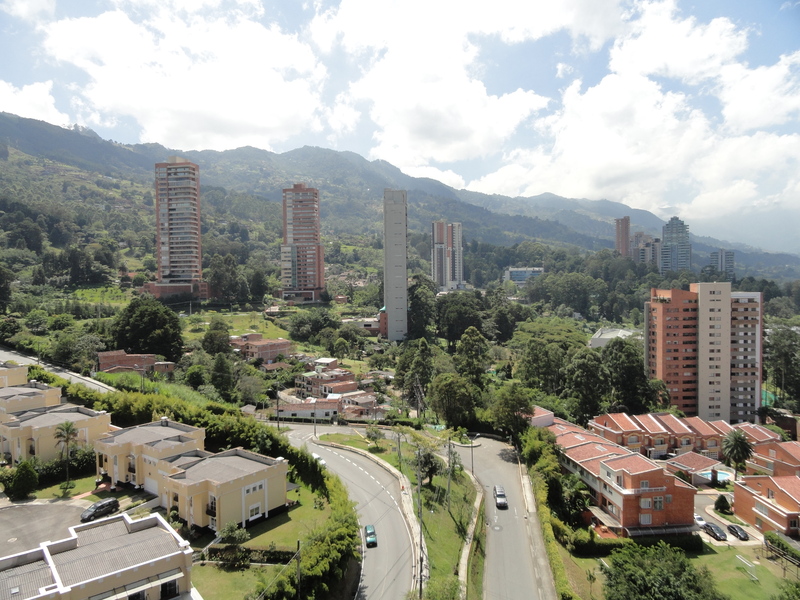 The sun rises on El Poblado, an upscale neighborhood on the mountainside surrounding Medellín, Colombia. Photo by Jamie Stark. I know, Pablo Escobar. But Colombia is starting to change. Colombia’s second largest city was named 2013’s Innovative City of the Year by the Wall Street Journal magazine and Citibank. New startup infrastructure like the Ruta N incubator has attracted founders and potential employees from across the globe – like Dutchman Alexander Tegelaars, who was in Medellín working as a bartender and interviewing at the numerous startups popping up. He had an obvious affinity for the entrepreneurial spirit reviving Medellín. “It’s a cultural factor, the paisas,” Tegelaars said, using the Spanish word for countrymen used to describe those from Medellín. Colombia’s famous startup sons, like Alexander Torrenegra and Andres Barreto, are pushing Colombia onto the world stage. The government is supportive of the tech community with initiatives like Colombia.co. Ruta N has fostered the growth of such companies as Ideatech, which makes nanosatellites that can reportedly be launched into space for a few thousand dollars. Drawbacks: I was robbed at knifepoint steps from Ruta N incubator. Although the crime rate has fallen here, the city remains in the top 30 most dangerous cities in the world. Medellín, like any city grappling with intense wealth inequality and past violence, has some work to do. Comparable startup community size: Milwaukee, Wisconsin. These and similar urban hubs in Latin America need both time and progress to rival first tier startup communities in the U.S. or Europe. Talent here must adjust to the idea of equity rather than an immediate corporate paycheck; more money beyond seed funding is needed to carry worthy businesses higher, and innovation must be promoted more than mere copycatting (“The Uber of Colombia”) to earn the moniker “innovative” for these LatAm hubs. Jamie Stark is a freelance journalist covering startup culture and social entrepreneurship in sunny Latin America. Follow him on Twitter @JamieStark. how beautiful is Medellin, the weather, the people the culture everything I’m planing to retire there. Carlos, it is only the infrastructure issues (traffic chaos, electricity ..) that the entrepreneurs should be worried about when looking in to investing in India. Having lived in India (& also in US), I don’t find poverty, sanitation issues etc.. affecting the growth of IT hubs. In fact I’ve seen many work-places/offices of tech companies in India which are swankier than the ones in Silicon valley ! I don’t know how the Latin American countries mentioned in this article fare in terms of Infrastructure. On the other hand, India is undisputed leader in the availability of “English Aware” skilled Talent (which is a ‘core factor’ as noted by Gustavo A. Torres G.. below). No Latin American country is a match for India in this aspect. Nice approach, but the analysis (and most comments) lack the core factor: human talent. Although the number of start ups is an indicator of projects pushing their way, it doesn’t give a clue of entrepreneurial inteligence in the region, nor in a given country or city. Reblogged this on The College Democrats of Madison. As long as Cristina Fernandez is at the helm in Argentina, Buenos Aires would be a ridiculous choice. How about Panama City, Panama? Panama has had one of the highest growth rates in Latin America even though it is a small country. It’s location makes it a natural hub plus it uses the US dollar as it’s currency. what about Mexico city? Its the 8th richest city in the world. Mexico’s economy itself is the 2nd largest economy in Latin America, and the 14th largest in the world. Mexico city has a yearly revenue 5x the size of Costa Rica’s economy and is larger than the entire economy of Peru. If Mexico city were a country it would be the 5th richest country in Latin America. Step aside Mexico, you owned the 20th century and you are a has been….the 21st century will now welcome bogota, Medellin, rio, Lima, Santa Cruz de la Sierra, Montevideo and the like…Mexico city very rich but it has reached a plateau and will not continue to not grow like the previously mentioned cities, sorry Maria but it’s sad that Mexico is currently owned by the savage drug cartels and corrupt government officials…..
You don’t have a clue. BA is probably the most corrupt and complicated city-municipality to business in all of South America. Get your facts straight and do your homework. This country doesn’t even pay it’s debt, no less punish it’s own people with senseless vacation taxes. What a joke. The country does pay its debts. Been paying religiously for almost 11 years. It just won’t pay the 2% who wants to get a better deal and destroy an agreement made with the othe 98% of the bondholders. Get your facts straight and do your homework. your title says 5, but you only mention 4?? Thanks for pointing this out, silly error. It’s fixed. I wouldn’t rule out Panama City. Even if Panama is a small country, there are some great benefits like: one of Latin Americas highest growth rate, dollarized economy, tax benefits, good infrastructure (the canal, airport hub, etc. ), relatively high amount of English speakers and it is more secure than many US cities. There is an entrepreneurial escape planned for this January in Panama for interested entrepreneurs http://www.bluecoastventures.com/entrepreneurial-escape looking to explore Panama.